Two items on my Thanksgiving table never change. There must be stuffing because it's totally the best part of the holiday. 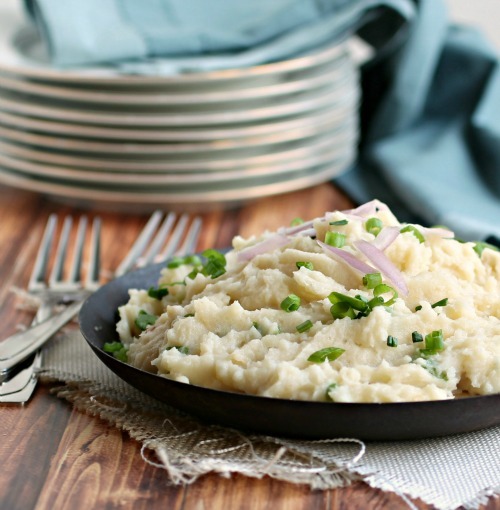 And there must be mashed potatoes because...gravy! But while I'm not willing to conceive of the holiday without the mashed taters, I'm willing to entertain a slight variation to them. When I was growing up, my mother believed that the root of all things delicious was caramelized onions and it's hard to argue with that kind of logic. They made the food taste delicious and the house smell delicious. 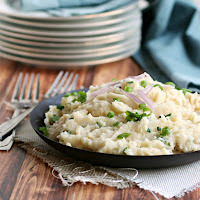 So her fluffy, creamy mashed potatoes were very likely to contain the bits of caramelized goodness and I think that's a tradition well worth carrying on. She didn't usually tamper any more than that with the taters but caramelized onions remind me of French onion soup and that brings up a need for Gruyere cheese. Actually, I never need much convincing to add Gruyere to just about everything. I kept a light touch here so that the onions would shine through and, of course...gravy! I doubt this bowl of mash will last long. Enjoy! Add the olive oil and one tablespoon of butter to a large skillet or cast iron pan. Add the sliced onion and saute on medium low heat, stirring occasionally, for about 45 minutes or until the onions are a light golden brown. Peel and quarter the potatoes and add to a pot of boiling water. Cook on high for 10 to 15 minutes or until the potatoes are tender. Drain and return to the pot. 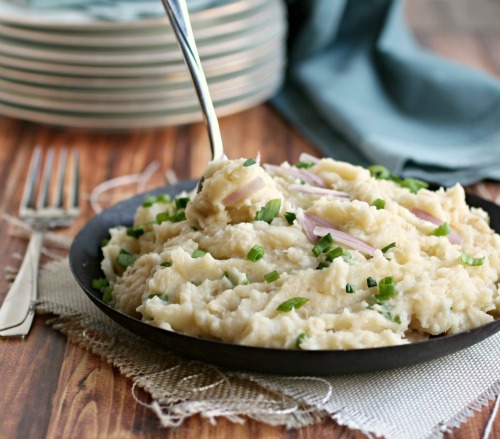 Mash the potatoes using a masher with a tight weave so that you get out all the lumps. Stir in the remaining two tablespoons of butter along with the milk. Fold in the caramelized onions, cheese and chives. Season with salt and pepper and serve hot. Your mom is a smart lady. :) I love gruyere cheese but have never thought to add it to potatoes. I bet this combination is glorious! I like your mom's style-caramelized onions are the source of deliciousness!! and yeahhh Gruyere was def. an awesome idea! My dad was asking me the other day was gruyere was (let's not even talk about how he attempted to pronounce it!). Sounds like I need to make him these mashed potatoes so he can try it. I love the flavors in these! So comforting. I'm with your mom on this one. In fact, I WAY overbought onions for Thanksgiving, and now I'm feeling the need to get my caramelizing on. And yeah, gruyere can go into anything, and I'm happy camper. Love this recipe! I like how your mom thinks! 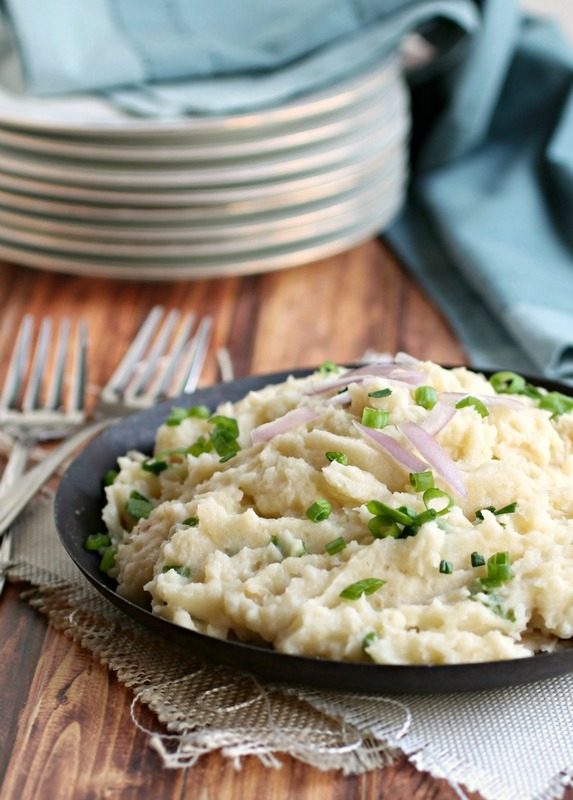 Gruyere + caramelized onions + potatoes equals a perfect win in my book!